Welcome to the Boquete Jazz&Blues Festival! We do hope that you’ll have a fabulous time! The organizers and our team of volunteers will do their very best to make your time in Boquete an unforgettable one! 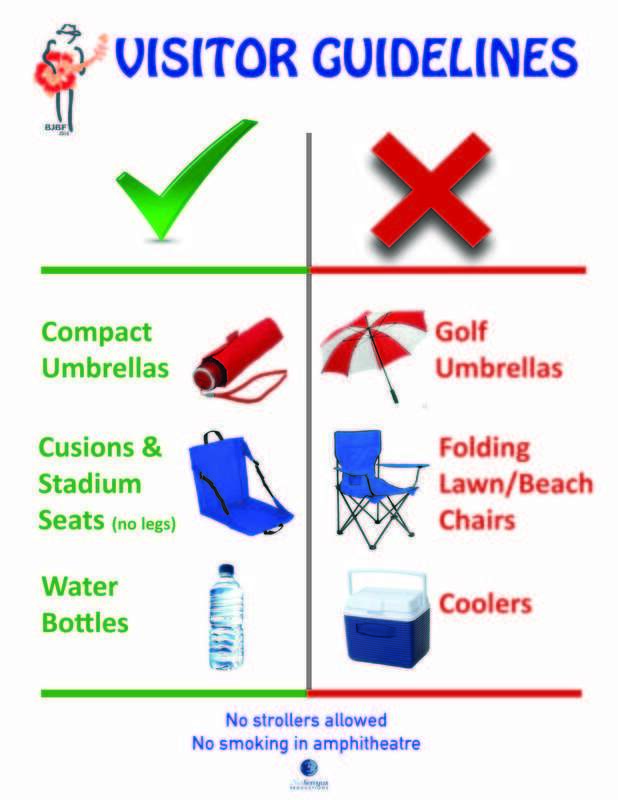 umbrellas or folding lawn chairs or beach chairs in the venue. Stadium seats with no legs are allowed. Keep yourself hydrated! You may bring a small bottle of water, and there will be plenty of water for sale. Coolers are not allowed in the venue. Food and drinks are available for purchase at very reasonable prizes. Please don't bring your own. You’ll support the festival with every purchase since the income from food and beverages sales is very important to finance the festival. valley which often creates beautiful rainbows. Evenings may be crisp and cool so bring a light jacket. you to remove any blankets or tarps that are taking space away from other festival visitors. Visitors who cannot climb stairs or are in wheelchairs will be accommodated in the front row of the amphitheater. detrimental to their hearing. If you choose to ignore this recommendation, toddlers under two get in free but would have to stay on the laps of parents at all times. Strollers are not allowed in the amphitheater. in the aisles. It is dangerous for children and adults alike. management declines any liabilities for children attending the shows. Parking space at Valle Escondido is extremely limited. The Valle Escondido homeowners' association will collect a parking fee. Please leave your car in town, we will have a shuttle service that transport you from your hotel or the central park to the venue for $1.00 each way. your fellow festival visitors. Please don't stand in front of the stage with your I-pads up high to take pictures. smoking allowed in the amphitheater. look at the goods that our fine local vendors are offering! If you have any questions or need help please don't hesitate to address one of our friendly staff members wearing t-shirts marked "Volunteer," 'Security," or "Staff". They'll be happy to help you. We love having you here! Have a wonderful time at the Boquete Jazz&Blues Festival!